Originally uploaded by Kim Elmose. Isn’t that a nice home to return to after work? 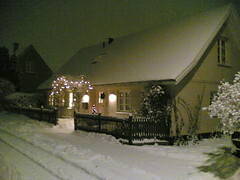 I love winter-time like this. Wired asks – and answers – in it’s December Edition: "Who’s afraid of Google.Everyone!" . The article lists all the areas that Google has been spreading into the last few years – places where others have build up huge operations: search in books, classifieds, video, telecom, operating systems, print, productivity programs and e-commerce – and we could add blogging, mail, hosting, mapping. The attitude is slowly shifting amongs people – to concern and a bit like the attitude towards Microsoft – still seen as the huge corporate monster who want’s to control our minds and net-life. Interesting to see how Google will adress that challenge. If you would like to attend to at some blogging-conference somewhere in i.e. Europe, it oftens costs some amount of money – registration fee at the conference and then hotel or other kinds of accomodation. You may attend as a private person and then that can be a heavy cost. But fear not – one of my friends, Henriette Weber, has come up with at neat idea: Bloggers – sleep with eachother. First step is to find one another at a wiki, she’s put up – Can I Crash. It will be listing bloggers who open their homes to other bloggers – who then again open their home to people attending conferences in their neighbourhood. Lisbeth Klastrup has found an article about the development of online newspapers in Scandinavia. A must read. Okay – to all luck for Typepad I’ve no access to DSL these days – so I couldn’t post to ramify. But bummer – the service was down for days. That’s just not good enough – for Christ sake. Maybe Typepad only will be a short acquaintance :-(. My first post in my new system – typepad.com. The reason is simple – and sad. I’ve run ramify since 2002 – to have a english weblog – to be able to engage in the global discussion. I started out with blogger.com – excellent system with a very good userinterface. Then moved to wordpress ‘cauuse of the db-features – It crashed during an update – and I choose b2evolution. In some sense a good system – but without the same drive as wordpress talking about developercommunity. A week ago I was meet with this disgusting message: "MySQL error! Error selecting database [dan10956_bvlt1]! Are you sure the databaseexists? Are you sure there is a valid database connection?" So – they got me. I’ve have no idea what to do – and won’t bother. I’m done with b2evo and now moves on to typepad and hosted services. I’ll have less customisation but – hopefully – more security on updates. I’m tired of using my time on speculating on updates, presentation and tech-stuff. I’m journalist, writer, contentprovider. That’s my core business so to say.